What’s next for Briarcliff Elementary School? JENNIFER GUSTAVSON PHOTO | Shoreham-Wading River School District Superintendent Steven Cohen, left, and school board president Bill McGrath at Tuesday night’s meeting. Shoreham-Wading River School District Superintendent Steven Cohen announced Tuesday he’s moving forward with a 2014-15 budget that does not include funding for Briarcliff Elementary School. SAMANTHA BRIX FILE PHOTO | The Briarcliff School in Shoreham. The Shoreham-Wading River school board is expected to continue discussions Tuesday night about future plans for the district’s elementary school program. During the school board’s Nov. 13 meeting, administrators discussed two options. The first plan would split the kindergarteners between Miller Avenue and Wading River elementary schools. The other option — the so-called “Princeton plan” — puts all the first- and second-graders in one elementary school, with the remaining grades up to fifth into the other elementary school. Both plans will include two drafts: one with Briarcliff Elementary School opened and with it closed. The school board will also begin discussing the district’s secondary program options and selection classification within the athletic program, according to the meeting’s agenda. The pubic portion of the meeting starts at 7 p.m. at the Miller Avenue Elementary School located at 3 Miller Avenue in Shoreham. Correction: An earlier version of this article incorrectly stated Briarcliff Elementary School may close as the district could not prepare separate plans for this year’s budget. Both plans the school board is debating offer options to leave Briarcliff open or close the school, depending on the results of May’s school budget vote. If voters don’t approve this May’s Shoreham-Wading River school budget, Shoreham’s oldest school, Briarcliff Elementary School, may be no more. Shoreham-Wading River’s school board is planning to give residents two options this spring: vote for a budget that pierces the cap but keeps the district schools the way they are, or vote for a budget in June that stays under the tax cap but closes the Briarcliff school and shuffles around the district. District officials had told the board it would be a logistical nightmare to draft up two separate plans, contingent on a vote outcome. The board must now choose between two plans. The first plan would split the kindergarteners between Miller Avenue and Wading River Elementary Schools. The other option — the so called “Princeton plan” — puts all the first- and second-graders in one elementary school, with the remaining grades up to fifth into the other elementary school. Both plans will include two drafts, one with Briarcliff opened and with Briarcliff closed, said Superintendent Steven Cohen. If the school closed, the distrct would save about $2 million in principal and teacher salaries and operating costs, he said. The Princeton plan would save slightly less money due to increased transportation costs, Mr. Cohen said, but would also allow teachers to collaborate more among the grades. Board vice president John Zukowski asked why it would be so hard to prepare separate plans. Assistant superintendent Alan Meinster answered that too many factors would need to be taken into account, such as instructing teachers and administrators on how to prepare for the coming school year. School officials later said that so long as the board decided on either the neighborhood school plan or the Princeton plan, the administration could prepare adequately to have options to keep Briarcliff open or close the school. JENNIFER GUSTAVSON PHOTO | Briarcliff Elementary School kindergarten teacher Jane Jacobs said she’s had a positive experience working with all of the district’s kindergarten teachers in one building. It’s the only elementary school in Shoreham-Wading River with a kindergarten program. Kitchens and cafeterias are being considered as part of an overall infrastructure improvement and grade-realignment plan being considered by Shoreham-Wading River School District board members and administrators. Currently, only the district’s high school has a kitchen and cafeteria. Roger Smith of BBS Architects in Patchogue gave a presentation during the school board’s Tuesday night meeting on plan, which divides students into buildings by grade level, an approach known as the Princeton Plan, developed in Princeton, N.J., and currently in use in many other districts. Under the consultant’s plan, Briarcliff Elementary School would become a kindergarten-only building. That school currently runs a K-1 program. During the presentation, Mr. Smith said grades 1-3 could attend either Miller Avenue or Wading River elementary schools. Students in grades 4 and 5 would go to the other of those two schools. Mr. Smith said the realignment plan would cost the district about an $8 million. In addition, he said, it would cost approximately $11 million more to build kitchens and cafeterias at Miller Avenue and Wading River elementary schools and Prodell Middle School. No such facilities would be added at Briarcliff. School officials stressed that the kitchen/cafeteria proposal was added to the discussion because residents have incessantly asked why there are no cafeterias in the schools. That component of overall infrastructure plan is not tied to the grade realignment proposal. If the school board decides to move forward with both realignment and facility upgrades, Mr. Smith estimated that it could vote on a resolution in October and set a Dec. 10 special election for voting on a capital improvement bond proposal. School board vice president John Zukowski said he isn’t comfortable making any decisions until the community has had more opportunity to weigh in on the discussion. Jane Jacobs, who teaches kindergarten at Briarcliff, said she’s had a positive experience in her building since it became the district’s sole kindergarten school about 14 years ago, after the Wading River kindergarten program moved to Briarcliff. Tuesday night’s meeting was the second public forum held this summer to discuss the district’s capital improvement options as officials struggle to find a way to cut costs while preserving programs and keeping the district under the state’s tax levy cap. Superintendent Steven Cohen said potential savings from the K-5 realignment would occur through reducing the number of class sections and reducing staff, including eliminating a principal, a psychologist and a music teacher. “We would be able to preserve class size, all of our programs and improve professional development,” he said. 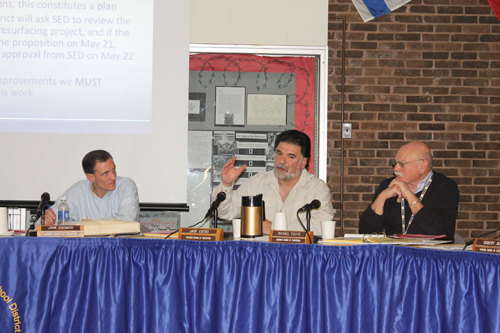 The board agreed to schedule workshops next month at the Miller Avenue and Wading River schools to discuss the plan with the community.